Recently, Shibuya has become Halloween central in Japan, with mobs of costume-wearing partiers descending on the neighborhood. While it looks like they have a blast, they do leave a lot of trash. But the following morning isn’t something you want to see. Via 2ch and Twitter, look at all this trash. Early this morning, volunteers, including people still in costume, got together and picked up the trash as they’ve done for the past few years. This is incredibly kind of them. 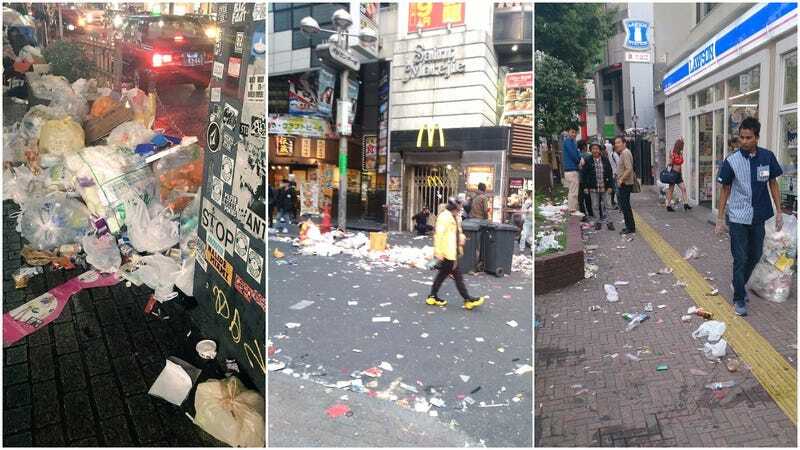 Convenience store staffers (pictured, above) also cleaned up the garbage people left in front of their shops. Sure, I know it can be hard to find trash cans in Tokyo and even harder when there are thousands of people. I also know Halloweeners are having fun and not everyone is littering, but come on folks, pick up after yourselves, take your trash with you if necessary and don’t throw your garbage on the street!